hey guys! Tonight I noticed a little white bug crawling around my monsterias soil. Pei do you have a photo [293343,Madison]? abcactus Hi Madison! 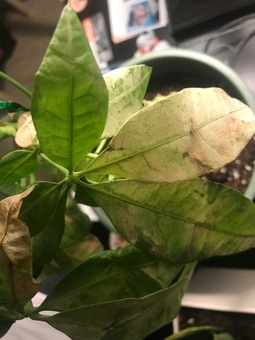 Could you please include some photos of the bugs because there are different bugs and some may be harmful to your plant. There are also different treatments based on the bug! Wishing you the best! 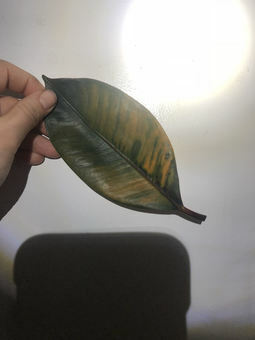 what's happening to my rubber tree? My rubber tree keeps losing leaves one by one. They turn yellow and mottled then fall off. Any idea what might be happening? It looks like damage from spider mites but I can't find any sign of pests - no webbing and no red dots moving! Stephanie A month or so ago I lost a couple leaves off my rubber tree in the exact same situation - they turned bright yellow and fell off, but there were no signs of pests at all. 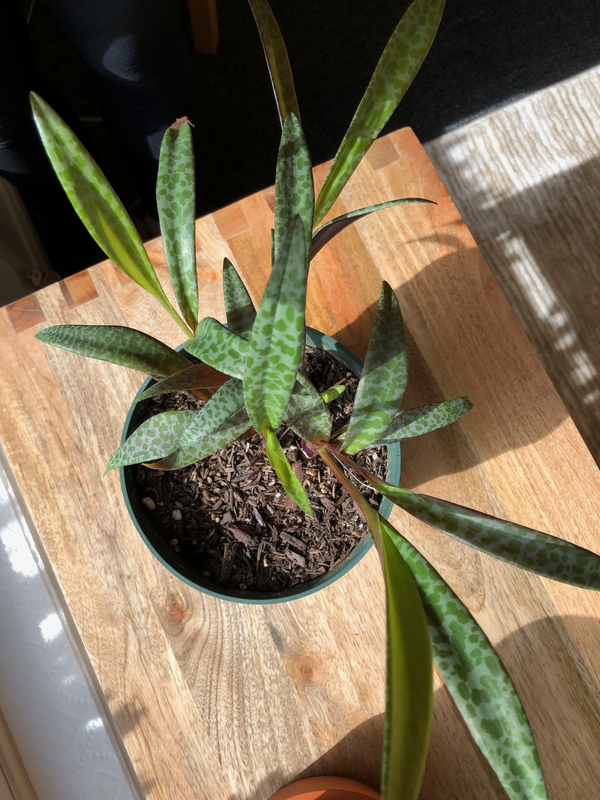 I found that putting the plant in the brightest spot in my apartment and waiting to water until the soil was completely dry put a stop to it. Good luck! 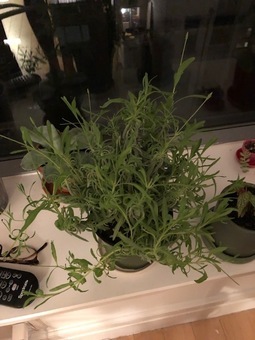 PlntNrd How long have you had it, how do you water it, is there drainage, and have there been any changes lately (moved to a different room, etc)? Spider mites can cause that mottling pattern you’re seeing, but they aren’t the only thing that does that. 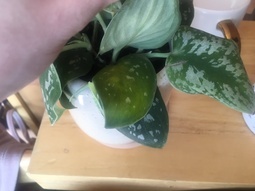 I would look at how you’re watering and if there’s drainage, because yellowing and significant leaf drop can be a sign of inconsistent/over watering. a little over a week ago, I got a philodendron silver. He came with some salt buildup on his leaves so I removed it with water and a little lime juice and it came right off. I gave him a tiny drink when I first got him, but other than that, pretty much left him alone. a few days later I noticed his leaves had drooped and curled up, so I felt his soil and it was dry about 3/4 of the way down so I watered him until water came out of the drainage hole and then dumped out the tray. about 5 hours later most of his leaves uncurled and I haven’t watered him since. today I noticed that one of his leaves has turned yellow but some leaves are still curled? does anyone have any advice? Pei dropped and curled leaves are a telltale sign your plant is thirsty! You want to make sure you water your plants throughly each time - meaning to make sure the soil is fully satuated, not just tiny bit of water! And keep in mind the brighter the environment it lives in, your plants will need to be water more frequently (especially in the summer!). 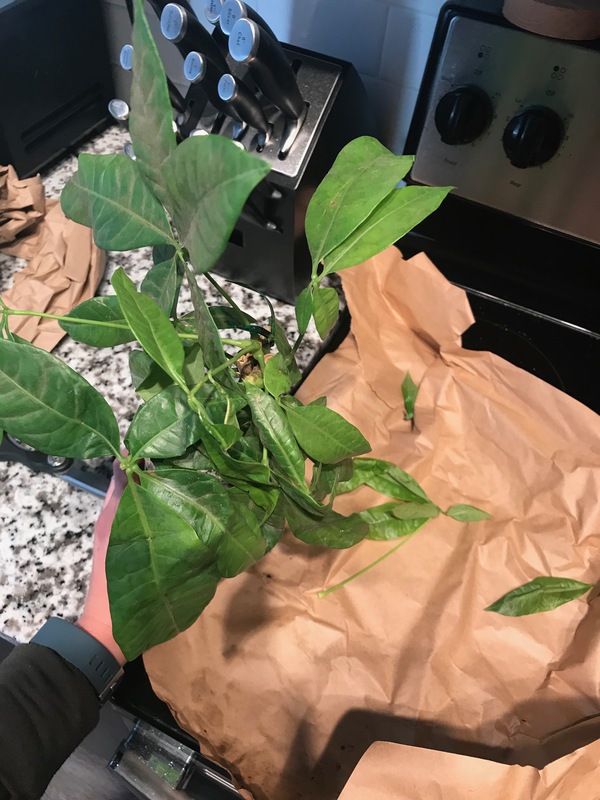 I agree with [288486,PlntNrd] the yellow leaves are a result of inconsistent watering as long as you correct it now :) you can simply snip it off! PlntNrd This may be due to allowing it to get too dry and then giving such a big drink of watering or inconsistent watering. He was definitely thirsty, shown by the leaves curling and confirmed when you checked the soil. Since it is new, it may have been getting watered more often and then, in your home, dried more than used to. 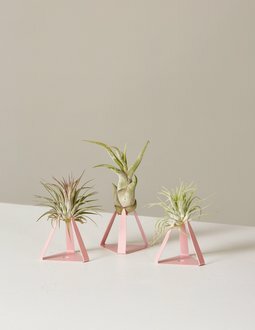 Plants go in to shock when they change environments and are first brought home, so that, plus a difference in watering technique may have caused the yellowing. Once leaves start yellowing, you can’t get them to go back to green. You can either cut them off or let them die naturally. Water consistently and let it adapt to its new environment and it should be just fine. Try to water before it gets to the point of physically showing symptoms of thirst. Over the past week or so there seem to be tiny flying gnat like hugs around a few of my plants (mostly a prayer plant and peperomia). There are quite a few plants in one location (the shelves in the picture), but these two are the only ones i notice the bugs around. Any tips on how to et rid of them? Thanks! Emily Thanks for the tips everyone! I have some tips to start with now, hopefully I'll be able to nip it in the bud before they spread anywhere else in the house. Brittany L Roth I've heard that mixing neem oil, water and a tiny bit of soap (just to distribute the oil) and spraying it on the soil will help! just do it every 2-3 and I think that'll help. So I would look at you watering habits, just to make sure there aren’t any issues with overwatering, but like I said, the bugs don’t just appear out of nowhere. And they won’t go away if you stop watering your plants. The eggs can stay viable in dry soil for months, much longer than your plants can go without water, and once you water again, the eggs will just hatch and everything starts all over. [278958,Pei] has also mentioned in other posts that diatomaceous earth is a good treatment. I have not personally used it, but I have heard very good things and am considering adding it to my normal soil mix as a preventative. hello! 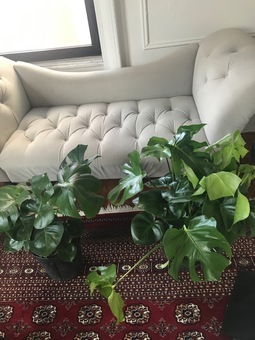 I recently just got a philodendron silver, and some of the base leaves seem very limp. Almost all the leaves seem super healthy and firm, just some of the seem limp and sad. Should I be cutting those off or should I leave them? 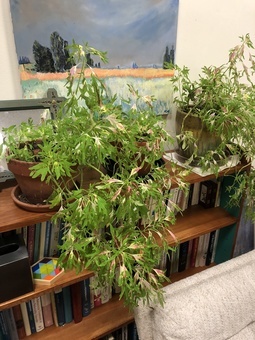 PlntNrd It would be best if you could upload a pic so we could see what you’re talking about, but limp leaves that look heathy on a plant that just arrived sounds like it’s possibly just underwatered and needing to adjust to its new environment. I can’t say for sure, without seeing, but unless the leaves are black, mushy, completely crispy, or totally yellow I wouldn’t cut them off. 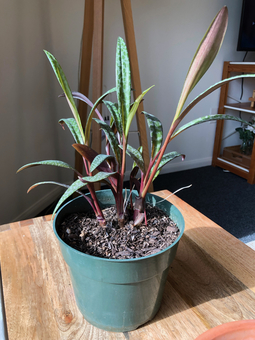 Philo leaves do get very limp and droopy when needing to be watered, but they also get a different kind of limp when overwatered. Look at how you’ve watered since you got it, whether it has drainage, etc. to try to determine if you’ve possibly over or underwatered it and go from there. Plants also can go in to shock when brought in to a new and very different environment and can take sometimes weeks to recover. I never repot right away when I get a new plant. I leave them in whatever I got them in for 1-2 weeks to allow them to adjust before repotting (repotting shocks them too). Help? I’ve had my new plants for about a month and suddenly this week there are hundreds of tiny flies all over them. They’re all over the new plants from the site and all over my house! PlntNrd Fungas gnats are made worse by overwatering, but they are a result of bringing an infested plant in to your home. Bugs don’t spontaneously spawn from water. The adults prefer a wet soggy environment and the larvae feed on roots and organic matter produced from improper water and care. There seems to be a lot of posts recently about this issue, you can read through them and see what has helped others. I have used Bonide systemic pesticide with great results, but you should also get those yellow sticky traps to deal with adults flying around. 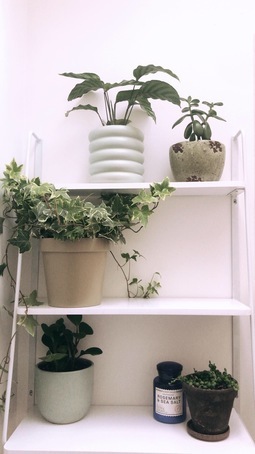 If one plant in your house has them, then it’s fair to say that all of them have them by now and you need to treat all of them at the same time. Some treatments also require multiple applications so make sure you read the directions of whatever if you choose to go with. Pei It sounds like fungus gnats. Those are the result of overwatering. I would suggest to first isolate your plant, let your plant dry out completely, and use diatematous earth powder to treat your plant. You can mix the powder in the soil at least 3" deep. This will kill the larvae. I recently purchased two Monstrea plants, and during shipping some stems snapped in half and have broken off. Do I leave the stem long or should I cut it off too? What is better for new/regrowth? Plants_Armstrong Commenting in here because I am also interested to hear other opinions. No expert but my guess is that if you have a stalk without a leaf and it's broken, it will naturally die off. 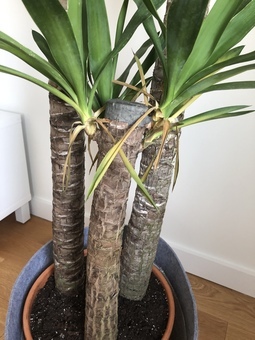 I have read that it is usually better to remove badly damaged leaves / limbs because the plant exerts more energy trying to deal with it rather than trying to repair a spot where it has properly been cut. It allows it to focus energy on growing something new rather than maintaining something that is problematic. I wouldn't take this as gospel, but something you might validate if you do other research. Pei I would suggest to snip it as near as the base (soil level) as possible. But I have definitely heard different theory that it's best to let the leaf runs it's course and die off. Honestly, I think it's more of a personal preference! 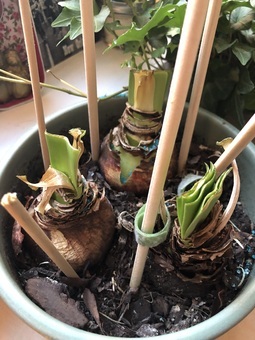 I am attempting to allow my amaryllis bulbs to rebloom - after cutting them back, however, they seem to be getting wilt-y, shrivel-y, and almost burnt looking on the ends. Any solutions? Or is this normal? PlntNrd Why did you cut them back? Well, let me put it this way, when did they bloom and how long after did you cut them? In order for Amaryllis to be able to bloom year after year, there are certain things that need to happen, and if they’re indoors plants, you have to do these thing to ensure rebloom. The first, and a very important, thing is never cut the leaves. Amaryllis need those leaves to store up enough energy for next year’s bloom. After they’re done blooming, they will continue to grow leaves for months. You should just let this happen and just take care of it like a normal houseplant. About 3-4 months before you want it to bloom again (the next year) you start the process to put it in to dormancy. To do this, you cut back on watering until you stop altogether and allow the foliage to die off naturally. Once that happens, place the pot in a cool dark place. Don’t put in refrigerator, this is actually bad for them and is only recommended if you’re trying to purposely delay blooming for an extended period of time, but you can time blooming with dormancy and it’s just not worth the risks. The bulbs can dessicate, get moldy, and even be poorly affected by certain fruits and veggies in the fridge. I just put mine in a closet on the floor. Leave it there for at least 8 weeks. When you’re ready to break dormancy, take the pot out, now is a good time to repot with fresh soil and put in a larger pot. Give a little water and place in sunlight. After a few days, water very well and continue normal watering from now on. I have 8 different Amaryllis bulbs that I keep indoors and get to rebloom yearly. The number one rule is do not cut the foliage. If you do, that the plant won’t be able to store up all the nutrients it needs long term. If your amaryllis just finished blooming and you cut the foliage, I would suggest continuing to care for it like normal. Sometimes the naturally lose leaves and they will continue to put new ones out throughout the year, so yours might replace the ones you cut. If you amaryllis just bloomed and you cut the foliage and are trying to force another bloom, it is possible that it will bloom again, but that depends on how it was taken care of the years before. The thing you should know though, if that’s what you’re doing, even though it is possible to get it to rebloom without proper rest and without allowing the foliage to grow, it will not last much longer. If the bulb isn’t allowed to store up the nutrients it needs and also rest, it will exhaust itself to death and you won’t have it for long. Your bulb also won’t be able to produce any offsets, and an Amaryllis that is many years old, with multiple daughters attached, all blooming together is an incredible sight. Pei It is normal. As you cut them back, the tissue would dying out slowly. It was purchased from a garden center, so they planted it for us. I bought a moisture reader as well and it looks like moisture is where it needs to be (in the 1-3 range). Einstein the yucca is in a corner right next to a very large window. Plants_Armstrong I've never had a yucca, but I might agree with the other post. Canes will naturally shed lower palms as they grow. Looks to me like it's doing okay. I'd say if you start seeing other leaves that are larger and closer to the center doing the same thing it would be cause for alarm. Pei it doesn't look like it's dying. It's just getting rid of the older leaves. However, how much and how often do you water it? It could also be thirsty.